Ringing in the New Year with 100 percent more Darkspawn, BioWare says its next Dragon Age Origins downloadable expansion pack will be out for Xbox 360 and PC on January 5. Sorry PS3 owners, you'll have to wait a few extra weeks for the DLC pack, which BioWare says should be available "later on in January." BioWare isn't saying why, though the original game was also supposed to arrive delayed on PS3 (it ended up shipping simultaneous with the Windows and Xbox 360 versions anyway). The 'additional content' nee 'DLC pack' nee 'sub-sub-expansion' (or whatever you want to call it) goes by the name "Return to Ostagar," referring to the game's Osgiliath analogue, i.e. border city between where the good and bad guys slug it out perennially. Apparently you're allowed to slip back to Ostagar to "exact...revenge and embark on a quest for the mighty arms and armor of the once great King Cailan when [you] revisit Ostagar, the site of the Grey Wardens' darkest hour." Sounds like fun. The expansion was due in late 2009, but missed the holiday window. 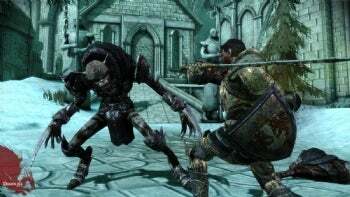 Prior DLC packs The Stone Prisoner and Warden's Keep were launched simultaneous with the game in November. Available next Tuesday, "Return to Ostagar" will set you back 400 Microsoft Points, or $5.